The Conspirator, Robert Redford’s new, never dull film, tells the story of the confusing, revenge-seeking aftermath following the assassination of President Lincoln. Or, more specifically, the trail of Mary Surratt (Robin Wright), who ran a boarding house once occupied by tenants later involved in the plot to kill the President. And because Mary’s son, John, who was said to be John Wilkes Booth’s right hand man, is nowhere to be found, officials want justice in the form of a hanging Mary. 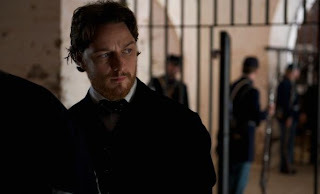 The innocence of Mary doesn’t initially concern her young attorney (James McAvoy). He’s more focused on making sure Mary receives a fair trial, when the powers that be demand anything but. Don’t worry, the verbose, historical plot is executed in a way that hardly appears verbose and overbearingly historical. Basically, the film isn’t muddled with obscure historical references and the characters don’t spit out more old English dialogue than is absolutely necessary. It’s an easy film to take, and one, I suspect, people who aren’t great fans of historical dramas (guilty) will enjoy. Much can be credited to this, including Mr. Redford, whose swift pace, warm photography, and careful casting allows The Conspirator to rank among his best films as a director. At the heart of The Conspirator is a breezy, well-informed screenplay by James D. Solomon. Solomon’s script is the rarest of things, moving along unsuspectingly without lending itself to cheap tricks and dime store twists. As Mary Surratt’s court proceedings progress, the political corruption of not letting her stand a fair trial becomes absurd. And soon, without us even realizing, we aren’t concerned with whether Mary is guilty or not, but rather, if the verdict she faces will be true justice. Gus Van Sant often speaks of the importance of casting every role, no matter how small. Whether they are Will Hunting or the dude at the back of the bar with one line, every casting decision needs to be deliberate and precise. I bring this up because that is exactly what Redford has done here. Every speaking part in The Conspirator is done with such conviction by the perfect actor, that it is impossible to point out a weak link. The call sheet of bit players reads like a dream list of character actors. Shea Whigham, David Andrews, Stephen Root, and Jim True-Frost are all effective in their brief roles. Supporting roles are cast invaluably to Colm Meaney, Danny Huston, Tom Wilkinson, Kevin Kline and Evan Rachel Wood. While James McAvoy and Robin Wright perfectly fall into the lead characters. Wright deserves specific praise. In what quickly turns into the first truly great acting performance of the year, Robin Wright does wonders with Mary Surratt. She keeps her moving, both physically and emotionally. Her subtle facial and neck ticks seamlessly display her hidden guilt. But guilt from what? Did she know her son was plotting the assassination of the President? Did she know he was plotting his kidnapping? Did she know anything? Those questions, I suspect, were the basis for Wright’s exercise in breaking down her character. Whatever method Wright lent to her role, it worked, flawlessly. Rented this and watched it with my dad a couple years ago. I wasn't really a James McAvoy fan until this. I feel the same way in that it's an excellent film, yet didn't get as much attention as it deserved. I'm glad it wasn't glossed up though, which is obviously one of the reasons it's such a fine piece. Yeah man, I'm with you all the way here. I've always thought McAvoy was okay, but he really impressed me with this movie. Loved the supporting cast as well.